It is a classical walking route in Lanzo Valleys, and it is a must for a hiker who explores this area. Stunning places, stunning landscapes makes this hike one of the most recommended in the Valleys. Lago della Rossa, the widest lake of Lanzo Valleys, thanks to the dam built from 1927 to 1939, has a surface of 500,000 m2, and a capacity of 9 million m3. Till Lago della Rossa the path is well marked, such as the track which descents form Passo delle Mangioire to Pian della Mussa, while from the lake to the pass the track is very tiny, and somewhere missing, making this hike inadvisable during a foggy day. From Grange della Mussa follow the street till taking the path which brings to Rifugio Gastaldi (indications), passing near Alpe Rocca Venoni. 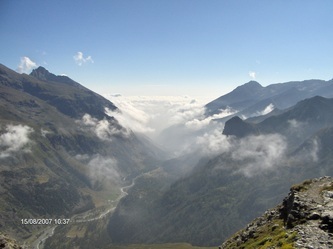 The track climbs and reaches Pian dei Morti (“Testa ‘d Mort”, which in the local dialect means “Land of dead”). At a juncture, turn left and follow the path. It climbs tortuously a steep grassy slope, passes near a fountain and arrives at the refuge (2 h). 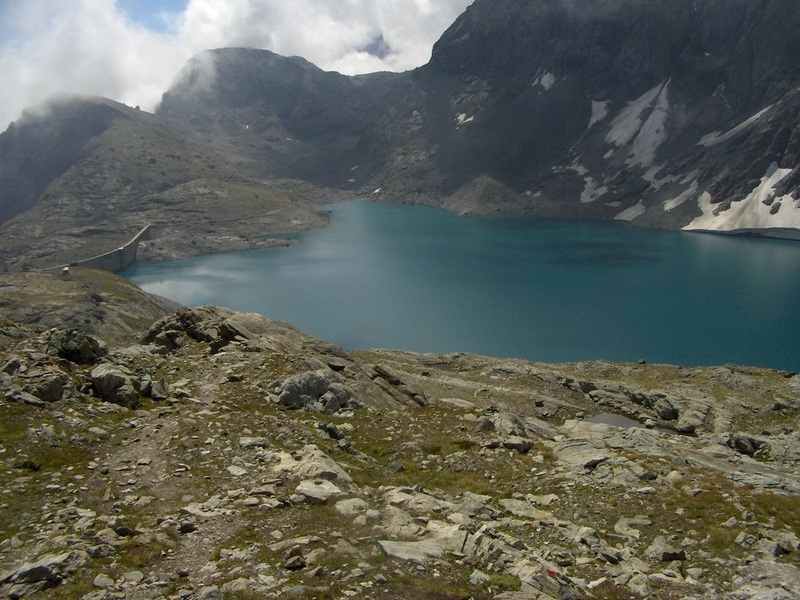 Continue on the left following the indications for Lago della Rossa and Rifugio Cibrario; after having lost approximately 150 m in height, ford a little river and climb the opposite slope. Ignore the ramifications directed to Colle d’Arnas and to Lago del Crotas, following the Tour della Bessanese track. 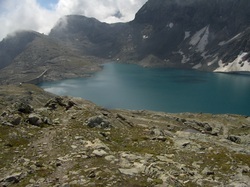 The path crosses few little snowfields and, after a ramp, reaches Collarin d’Arnas, a mountain pass not far for Lago del Collarin. 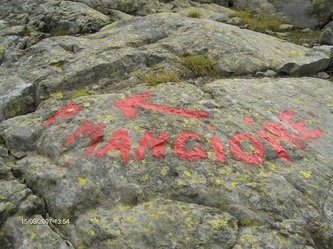 Follow the track till arriving in sight of Lago della Rossa; go down in the direction of the lake, arriving near a rock on which it is written “P. Mangiore” with a written arrow turned towards left: leave the Tour della Bessanese track in order to follow this indication. The path reaches a little mountain pass, and descent the opposite steep slope. At the end of the descent, continue walking towards Passo delle Mangioire, trying to lose height the least possible (avoid the track which descents to Usseglio). Reached Passo delle Mangiore after a little ascent, follow the path which climbs down the opposite slope, crossing a narrow passage. Walk on the track, reaching Pian degli Alamant, a flat land full of fountains, and Alpe Saulera 2095 m. Ignore the ramifications for Colle Sud del Tovetto and for Colle Tovo and go straight on, climbing down a slope covered by alders thanks to a wet path, till arriving near the white houses of Villa Sigismondi. Cross the Stura River and reach Grange della Mussa 1761 m.